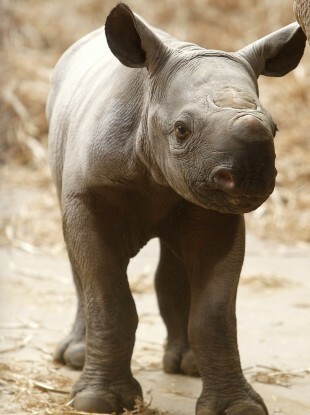 A baby black rhino at a Chester Zoo. POLICE IN THE UK have warned wildlife parks that they are being targeted by rhino poachers. The Aspinall Foundation, a conservation charity, has subsequently appealed for volunteers to help guard its herds of black rhino. According to police sources, poachers have started to plot raids in the UK after hunting the critically endangered species to the brink of extinction in the wild. It is understood the gang or gangs have been looking at the Port Lympne and Howletts Wild Animal Parks in Kent as they are home to the world’s most important collection outside of Africa. Black Rhino are hunted for their horns, which some claim have medicinal qualities. Usually they are hacked off the corpses and traded for more than the value of their weight in gold. In the past seven years, the foundation says it has bred 33 black rhino in captivity but insists are then kept in relative freedom on hundreds of acres of countryside. Many are also participating in the group’s Back to the Wile programme, meaning they will be returned to their natural habitats across the world with the aim of replenishing the species. Three of the park’s rhino have already returned to Tanzania where they are now believed to be “flourishing”. “It is tragic beyond belief that, as we do everything possible to restore these magnificent animals safely to the wild, the human traders who seek to profit from their slaughter should bring their vile activities to the UK,” said Damian Aspinall. Police constable Michael Laidlow, wildlife crime officer for the Kent force, said they had received an anonymous tip-off about a possible attack on rhinos. “All our wildlife officers are aware of the information and we’re taking steps to increase patrols in the area,” he said. There are only about 700 black rhino still surviving in the wild. Email “British wildlife parks being targeted by rhino poachers”. Feedback on “British wildlife parks being targeted by rhino poachers”.